Cooking dinner at home every night can sometimes seem like a lot of work, especially when there is a tasty drive through around the corner or a ready-made pizza in the freezer. And yet, putting that extra effort into cooking and enjoying a meal at home as a family offers a multitude of benefits worth the energy. 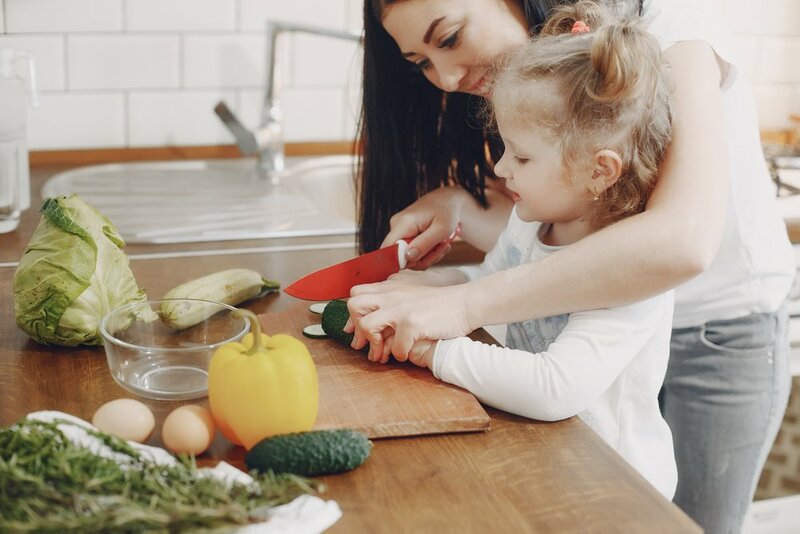 From quality time spent together to the fostering of healthy habits kids will take into their adult life, there are numerous reasons why cooking and eating together as a family is incredibly important. Kids are more likely to help with cooking when they perceive it as a way to be in on the action, not just as another chore. Young children particularly are often anxious to participate when parents make a meal, but their lack of fine motor skills and short attention spans can often create a big mess. However, letting them help anyway has powerful effects throughout their lives. For one, when children help with the meal prep process—from grocery selection to putting together the ingredients—they are more likely to try what they helped make, and therefore have a more adventurous palette. They might become more curious than the average kid about food and how different flavors work together, giving them a leg up once they leave the nest. Children who are never invited into the kitchen can build baseless aversions to certain healthy foods, like seafood and green vegetables, which can stick with them well into adulthood. Eating out or ordering in can be convenient, but it is also an expensive and unhealthy routine to fall into. Planning, shopping and cooking (and cleaning!) together inspires and supports a healthy eating environment, and results in more vegetables and vitamins being consumed, according to registered dietician Angela Ginn. But what to make with little ones? A lean, neutral protein like Tilapia is perfect for even the pickiest eaters, and since it can be served in so many ways, it is easy to use it as your protein of choice in numerous recipes. Frozen seafood is also a great and easy choice that can make dinner come together in a snap without much planning, so it’s great to teach kids this healthy trick so that they realize there’s a handy alternative to fast food. With phones, computers and portable game consoles out 24/7 and our hectic schedules keeping us busy, getting face time with the whole family can easily fall by the wayside. But it’s crucial to bond without electronics and to truly connect with and understand children as they grow and change. Routines are proven to be great for families, whether it’s breakfast, lunch, dinner or a nightly dessert run. 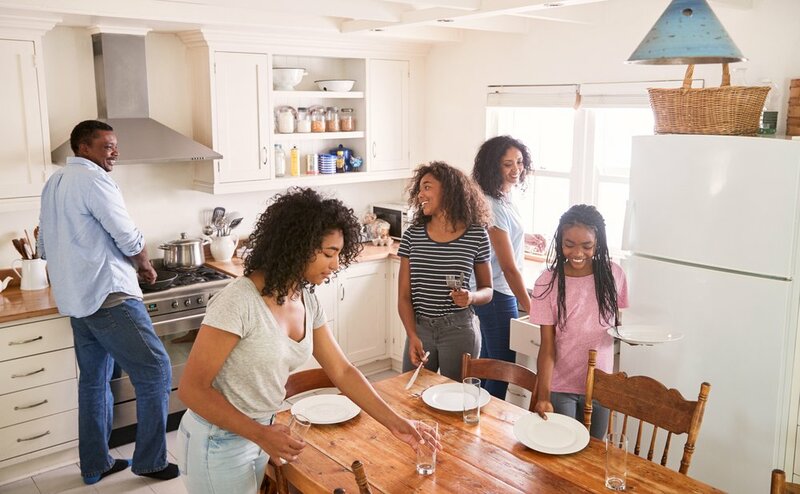 A recent study showed that teens consistently got higher grades when they dined with their family upwards of three times per week, compared with other children. And that’s not all. The Family Dinner Project cites a host of benefits from nightly family dinner time, from higher self-esteem to lower rates of obesity. So, turn off the TV, gather the whole family at the dining table and enjoy a nutritious meal while reconnecting with your favorite people. Want to give your kid a sense of agency, adventure and set them up for a healthy future all in one fell swoop? Hand them a task in the kitchen, and watch them flourish. They might even be preparing dinner for you someday in the near future! For more meal prep-inspiration, check out Chef Series: Andrew Gruel Shares Five Ingredients to Brighten Up Tilapia. These ingredients are all likely to expand your kid’s palettes too! Photo Credits: Monkey Business Images / Shutterstock Inc., Stock-Studio / Shutterstock Inc., Monkey Business Images / Shutterstock Inc.